A blend of Reiki, Energy Healing, Conscious Healing, BodyTalk Access and up to 46 healing crystals laid out in a grid formation around and on the body. The practitioner guides you through breathing techniques and a tuning in process while providing reiki. Crystal Reiki Healing balances the Chakras, Aura, Mental & Emotional bodies, as well as transmutes anger, fear, sadness, guilt, shame and much more. The practitioner will pick from a Mental/Emotional Cleansing and Re-patterning Layout; Basic Chakra Layout; a layout to clear the Aura and Strengthen the Etheric Field; Crystal Karma Cord Cutting or the Transmutation Chamber. Reiki along with each crystals own unique healing property will align the energies of the body. These particular crystals are healing tools that have been infused with the Reiki energies. Each healing has a specific set of crystals that are only used for that healing. The crystals used as reiki healing tools, allows you to feel like you have up to 46 little Reiki Master’s working on you! 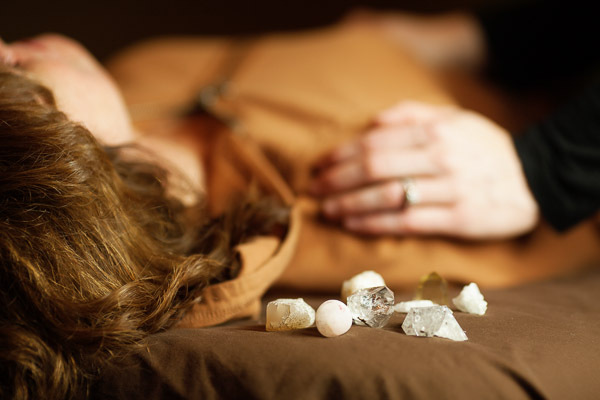 Interested in learning Crystal Reiki Healing? Click here for class information.